“The infinite God cannot be defined by that which is finite. He who is limitless cannot be comprehended by that which has limits, unless he chooses to reveal himself within the context of those limits. Imagine that we live in a two dimensional world with a three dimensional God. If this three dimensional God were to stick his finger into our two dimensional world we would describe his cylindrical finger as a flat circle because we wouldn’t have any way of accurately seeing his finger for what it is. As a pastor living in a college town I run into skeptics, doubters and unbelievers regularly. 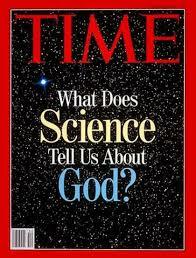 One of the most common objections I hear about the Christian faith is in regards to science. People just can’t seem to wrap their minds around God. I get it. I really do. I have a degree in biology and psychology. I’m more than familiar with naturalistic evolution, evolutionary psychology and the behavioral sciences than I’d like to be. I’ve taken physics, chemistry and genetics. I, like many of my peers, appreciate hard facts, empirical evidence and measurable results. In a world of scientific questions, factual evidence is our friend. Measurable outcomes are important, but when it comes to God I’ve learned that they just aren’t enough. 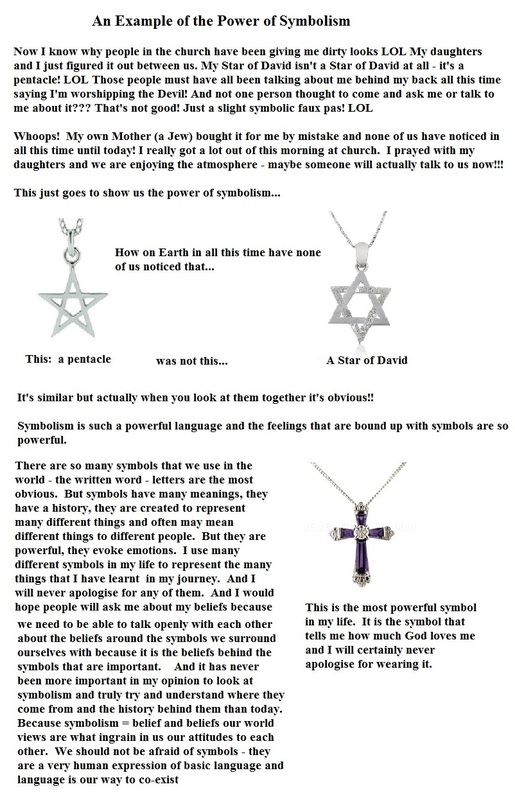 I haven’t posted any dream interpretations in here for a while so today seems the perfect time to do that because it is related to my posts on Divine Symbology https://lauracrean.wordpress.com/2015/03/29/my-research-into-symbolism-and-a-personal-epiphany-on-divine-symbology/ I am posting this alongside those posts because I thought it was important to do so. I don’t know if anyone gets anything out of all this other than me. I can understand that I probably come across as a bit strange, but this is my way of understanding my own thought processes and I like to share it all because you never know when you might connect with someone else who has similar thoughts. We all need others to relate to us don’t we? I have to say that when I woke up at 4am this morning on the tail end of this dream, my initial thoughts were that it was a really scary dream. I thought to myself “No! That’s horrible Why would I be dreaming such a thing? But now I have looked at the symbolism behind it it makes sense to me. So now I will write the dream and then the interpretation. I was in my house (that wasn’t my actual house but in the dream it was my house) and I heard a noise coming from the chimney. It was a baby girl about a year old. Anyway, for some strange reason it terrified me that she was there and I tried to kill her by striking at her chest with a hollow metal pipe, which left a circular impression in her chest. I thought she was dead and I was horrified that I had killed her. I threw the bloody pipe in the bin and then tried to wrap up her body in a sheet and was contemplating how I was going to dispose of the body when I realised that she was actually alive. At first I was horrified that she was alive and possibly suffering but couldn’t imagine myself now killing her again to stop the suffering, so I wondered how I was going to get her back to her mother to be healed and get away with her attempted murder. And then I thought I would just say that when she fell down the chimney she had landed on the pipe that was propped up there and that is how she got the injury. I was sick with guilt of what I had done and her pain but I didn’t want her to die. I carefully wrapped her and held her close to me saying I was sorry over and over to her and that I knew what I had done was evil and that I loved her and hoped she could forgive me one day. I knew she was too young to talk properly and didn’t think she would tell her mother what had really happened. I carried her round to the house next door to tell her mother she had fallen down my chimney and found the house unexpectedly unaware of her disappearance. The old man that was supposed to be watching her had fallen asleep and he blamed another younger man who was in his own room doing his own thing. I could see the fire guard pushed out of the way, so I could see how the child had gotten to her chimney and crawled up it and then fallen down into mine. The mother came home at that point and I told her we needed to get the little girl to the hospital quickly because of what had happened. I told her she was fine (and she was, she was awake and aware and the injury wasn’t as severe as I had at first thought) but you could see the circular injury made by the pipe. Obviously horrified and in shock, the mother ushered me to the car so we could drive straight to the hospital. I just held on tight, cuddling and comforting her all the way to the hospital and then the mother took her and she was put into a hospital bed. I turned to leave happy that she was OK and was being cared for now and getting treatment and that she would make a full recovery, when all of a sudden she fell out of bed and died. I remember feeling absolute horror and knew that I had killed her; I was absolutely sick with guilt and woke up crying thinking “No! God, why would you show me this in a dream?” I just lay there thinking no.1 what a horrible, horrible dream and no.2 Thank God it was only a dream and I hadn’t really just committed a murder of an innocent child in cold blood. The first thing that struck me was the fact that my investigations into symbolism yesterday had led me to the conclusion that the circle represents God, so the circle shaped incision in the girl’s chest just screamed out at me that it represented God and the fact that it was over her heart must represent’s God’s love – to me the heart, the heart chakra represents Jesus. The pipe and the chimney are both interesting symbolic images. The house is always the self, so the chimney can be seen as an extension of the self, a channel for cleansing (think of smoke going up a chimney). However the child (that vulnerable, innocent aspect of myself) went both up her chimney and then down into mine. To me this could be seen as a transition of channelling new aspects of myself. By killing the child I am attempting to kill off old attitudes. However I think it is like dying and being born again at the same time. The pipe represents a conductor of energy (think of each being as like a pipe with energy flowing through them) it represents the ability to tap higher levels of power and connect conscious and unconscious aspects of self. 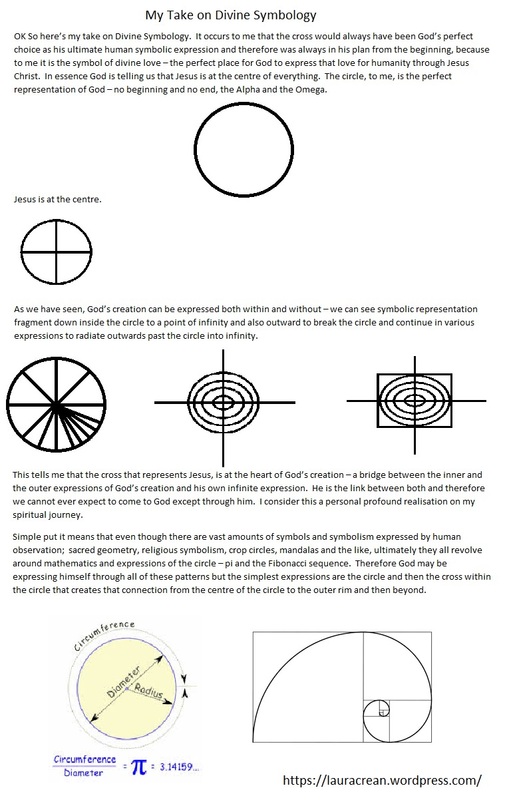 In the context of this dream I see it as God stamping himself (his image – as represented by the circle) into my heart – therefore awakening me to accepting Jesus into my life anew as my new attitude or an awakening or affirming attitude. It is like God saying to me – you are killing off old attitudes through me. But the child continuing to live at that time, even with the circular injury (God’s mark) and I think this was Jesus’s way of telling me he is the ‘living God’ and he is living in me, in my heart. The fact of the girl dying in the end was I believe God telling me that the old me (my attitudes and my sins) are now dead. The hospital represents a healing centre. There were 3 buildings or houses in this dream – the child’s, mine and the hospital. I think the hospital represents the House of God and so healing makes sense. Possibly they represent the 2 trilogies; Mind, Body and Spirit – Father, Son and Holy Spirit. All the people in this dream of course represent aspects of myself. I think the old man represents the rational, intellectual, wise (knowledge based) aspect of my psyche. He was asleep, leading to the child (the innocent, vulnerable aspect) to escape. Perhaps those thoughts and attitudes that I had thought were wise were just holding me back, keeping me a prisoner (trying to rationalise everything). 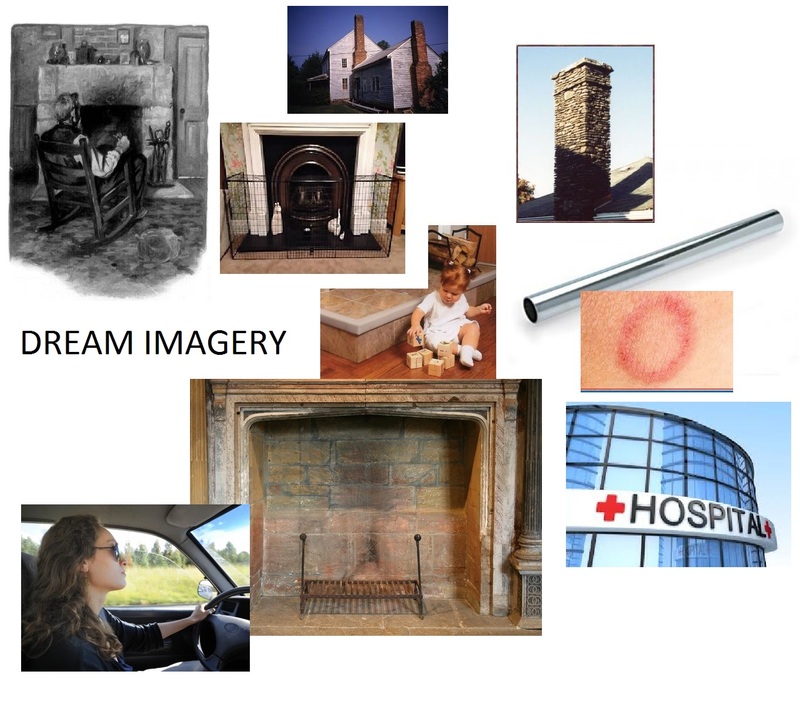 I was asleep and needed to be awakened and reborn as the baby (the chimney being the birth canal) Here is another trilogy – the old man, the young man and the baby girl. I’m not sure how the mother fits into this dream. I certainly took her baby away from her and felt nurturing towards her after the initial violent act. Maybe it is a way for me to nurture myself (self soothing) telling myself to stop beating myself up about everything and just accept God’s love and to love myself. I was glad the mother was driving to the hospital so that I could hold the child close to me in the car. The car is my vehicle through life. I wasn’t sure how that related but considering that I was being driven to the hospital and since all the people in the car (another trilogy) – Mother, me, baby girl – were me – I was being taken to healing, to the House of God. All aspects here were feminine leaving the earlier male aspects behind. Now the feminine, intuitive, creative, spiritual aspects are being brought together in the hospital for God to tend to. This made me think of the teaching at the Church I have been re-visiting – Kings Church in Eastbourne East Sussex – last Sunday and the few weeks before so I thought I would share it. The Swiss theologian Karl Barth was asked by a student during a seminar in the United States, “Dr. Barth, what is the most profound thing you have ever learned in your study of theology?” Barth thought for a moment and then replied, “Jesus loves me, this I know, for the Bible tells me so.” The students giggled at his simplistic answer, but their laughter was of a nervous sort as they slowly realized Barth was serious. 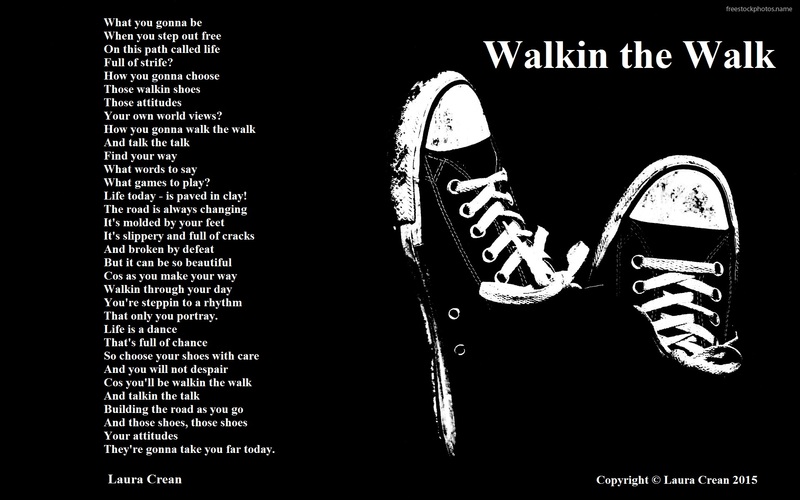 This poem is for my 3 gorgeous daughters. This is their year of changes. All of them are stepping up to the next level of their journey. My youngest daughter Alice is moving up from junior school (year 6) to high school (year 7). This is a big year for her, she’s in that pre-teen period where she is no longer a baby but will always be my baby girl. Soon the hard work starts as she embraces that journey towards GCSEs and puberty. She is steppin onto a path both her sisters have walked, in a good school that I know will nurture her, push her forward to work hard and find her path, so many paths she could take in her young life. My middle daughter Shannon is coming out of that period and moving on up to College, leaving year 11 and onto training in her chosen career – the Performing Arts. She is such a bright and driven young lady and her shoes are steppin out onto the stage of her young adult life. My eldest daughter Ellenor is steppin out on the next big challenge. She’s leaving college and entering University. She is full of ideas and ready to push forward and really run for that degree in her chosen subject in 3D art, her journey is exciting and the hard work is just beginning. And as for me – I’m still on that journey and everyone’s path is different, everyone’s shoes are different. I was sitting on the bus yesterday and I just noticed out of the window, people’s shoes. All different, distinct and right for each individual, carefully chosen or subconsciously chosen to match their personalities. And as I watched those shoes walking around town I wondered about each of their attitudes to their chosen paths through life. That’s when the poem began to live inside me. I looked at my comfortable, sensible shoes and I wondered what they said about me and my journey. I need comfortable shoes because I still have a long walk ahead of me, but I’m ready for it and I’m now going to embrace it and I want my children to step out on their journeys and be ready too – with shoes that fit, have style and say – let’s do it – let’s walk this walk. I couldn’t be prouder of all of them. And in my mind’s eye I can see one more pair of shoes walking alongside my family, a pair of well-worn sandals. And I know that he is smiling and keeping pace with every step we take, ready to lift us up on his shoulders every time the walk gets too hard. He will make sure we don’t get left behind as long as we need him to but then he will put us back down and give us the strength to run as fast as we can to the finish line. What shoes are you putting on in the morning?